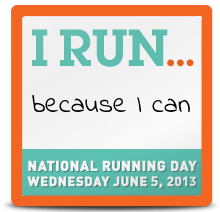 National Running Day – Why do you run? This is one of the mantras I say to myself when I am crashing during a run. I run because I can. It is a simple way of saying that I am grateful for being able-bodied and in good health; I owe it to myself & those who died from illness to take care of myself and appreciate my health while I have it. Go ahead and make your own badge and share your reasons. Let me know in the comments!